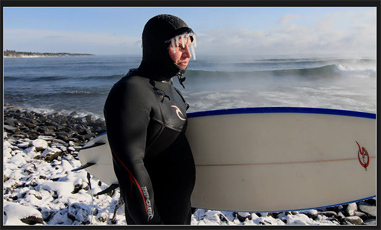 I cover this scene in my story “Hanging 10 (Degrees) on Icy Lake Superior” in today’s New York Times. All around the Great Lakes, from breaks on Lake Michigan to western New York and Lake Erie’s shore, a freshwater surfing scene has emerged in recent years. 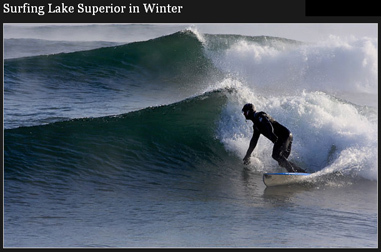 On Lake Superior, where winds swoop hundreds of miles across open water, surfers swim and paddle year-round to ride waves as tall as 20 feet, rushing tsunamis tumbling on an inland sea. Each fall, Lake Superior’s famous “gales of November” signal the start of the cold-weather surfing season, when snow piles up in the forest and waves pop off the lake. Wind moving from a Canadian front, coursing south and west against Minnesota’s North Shore, pushes water into rhythmic waves at more than a dozen breaks along Minnesota’s lake-hugging U.S. Highway 61.